Responding to a query by Fordham Daily, John Carroll, director of Fordham’s Public Safety Office, clarified a statement his office made last month and said definitively that the new ID card readers have been installed for use this year at Rose Hill campus entrances, FMH, the library and the Lombardi Center. 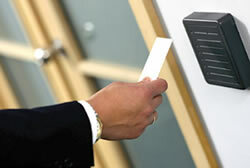 The ID readers will not be used to gain access to other academic buildings, Carroll said. In addition, the readers will remain stationed at each residence hall on campus. A pervious version of this article incorrectly stated that readers would be stationed at each building entrance on campus. This ID card swipe system has been in the planning stages for 10 years, according to Jason Benedict, executive director of Fordham’s Information Security Office. It is finally being implemented because of high student demand, he said. As part of the system, Fordham officials will be able to keep a digital log of timestamps, detailing which students enter which buildings at which times. Despite potential privacy concerns, John Carroll, director of Public Safety, says the new system is a plus for the campus community. What about traffic backups outside FMH in between classes? No word on the cost of this technological upgrade.